Casually treading water in Astoria Resort’s heated outdoor infinity pool, face tilted skyward (eyes closed of course – it’s a very bright, sunny day, plus closing your eyes adds to that air of bliss one must fully adopt at spas), a rosy glow colours my cheeks. The skin-tingling winter air is probably about 80% responsible for this. The other 20%? Oh, that’ll be shameless smug delight. When it’s out-and-out pampering you’re after, a spa break is the obvious answer. But this is 2019 – ‘obvious’ just won’t cut it. A gorgeous hotel, top-notch facilities and the promise of a just-roll-me-into-bed-afterwards massage are all good – but what about the rest? We want nature, we want #nofilter views, breakfast buffets served with a side of mini adventure, and bonus points if it’s within relatively easy reach. A super-scenic half-hour taxi ride from Innsbruck airport, Astoria fits the bill. Astoria started life as a family-run business back in 1950, quickly making its mark as one of Austria’s most modern and glamorous hotels. Its blend of chic luxury, home-from-home comfort and Alpine spirit was a hit, attracting a cool upmarket crowd. As the resort and travel trends evolved, it’s fair to say its appeal has widened. 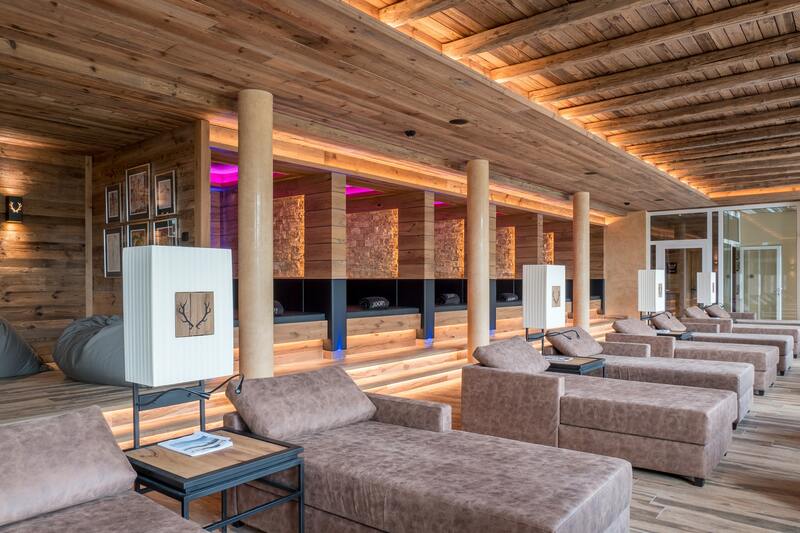 Although now, coming to Astoria for a touch of the high life is perhaps a bit more about its geography – perched 1,200m above sea level at the top of Seefeld, a picture-perfect Alpine village slap-bang in the heart of the Austrian Tyrol – and the 5-star superior-rated spa, than cigars and cocktails in the lounge. The altitude and mountain air are practically a spa treatment in themselves, credited with playing a key role in why guests so often proclaim to sleep like logs and leave feeling gloriously revived. That’s not to say luxury lounging is out. The resort completed a major partial refurb and restyle last year, with Elisabeth Gürtler, the current owner, giving the entrance lobby, bar and lounge area a stunning new look. Still 100% Alpine chic, no detail has been spared attention. The interior design involves a colour scheme of deep reds, exposed wood and brown leather. Antlers adorn the ceilings, while candles and a focal-point open fire flicker invitingly. It looks good, but most importantly, it feels good. The minute I arrive, I instantly want to curl in a corner with a magazine and hot chocolate, phone off and out of sight. The refurb introduced 24 new suites too. Splashing out on the best ones guarantees sprawling living space, panoramic views and tubs with room for two. But my cosy double – complete with mountain-facing balcony, walk-in shower and separate bath, and far too many sumptuously plump pillows than you could ever possibly need (joy!) – is ideal. Not that I want to spend too much time in my room, of course… Here for a long weekend, my itinerary is packed – first and foremost with some serious R&R. The spa has also undergone a partial refurb, with further updates in the pipeline. Split into two main areas, one is ‘textile-free’, meaning strictly no clothes or swimsuits allowed (and yes, it’s mixed sexes). The two large swimming pools and outdoor salt-water whirlpool/Jacuzzi are in the textile zone, along with generous lounging areas, daybeds, sauna, steam rooms and treatment rooms. Day one, I stick with the swimsuited section. 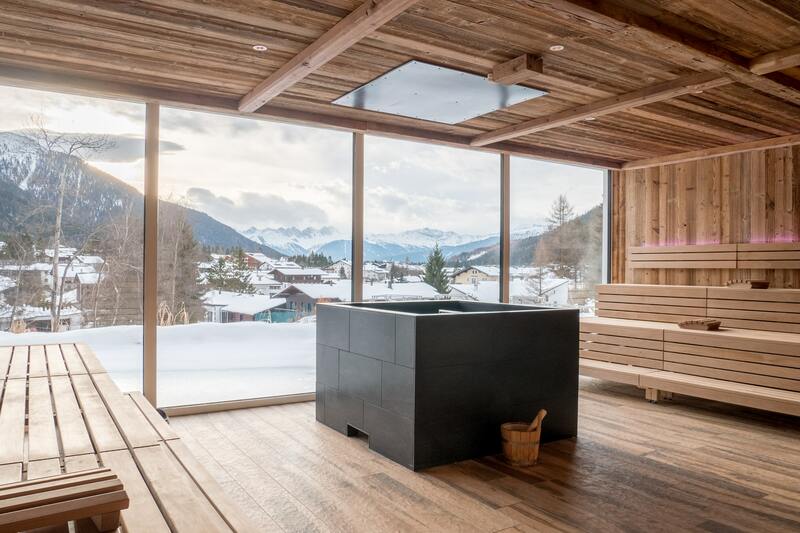 But much of the modernisation work’s taken place in the textile-free area, which includes a gigantic sauna with floor-to-ceiling windows offering panoramic views of the Alps, as well as a small outdoor infinity whirlpool. By day two, it’s too much to resist and I cast my British prudishness and bikini aside, grab a towel (for hygiene, you must always sit on a towel) and head for that sauna, a 42-square-metre box of bliss. Sun floods in through the glass and, within seconds, I’m utterly engulfed by the heady scent of wood and heat, so absorbed in the moment that my fully-bare flesh matters not a jot. There’s an impressive menu of treatments available too that are relatively reasonably-priced (from €45/AED 189 for a 25-minute ‘Fango Mud Bath For The Back’ treatment, while many of the hour-long massage-type treatments come in at under the £100 mark), plus a gym and timetable of classes guests can join in for free. I opt for a shiatsu session (€95/£85 for 50 minutes) with Markus, the lead therapist who, radiant and calm in equal measure, embodies holistic wellness and mountain-dweller fit. He and his team are passionate believers in proactive good health. Here, a visit to the spa and sauna is just sensible self-care, rather than indulgent pampering – that’s the Tyrolean way – and if their glowing skin and active lifestyles are anything to go by, it’s a formula that clearly works. A shiatsu virgin, I’m unsure what to expect. Rooted in traditional Chinese and Japanese medicine, it literally means ‘finger pressure’, and involves lying on a mat while Markus releases blockages in my energy flow via gentle pressing, sweeping motions and some very light joint movement. Markus tells me I’ll feel heat in my skin when the ‘unblocking’ is working, and he’s right, but it’s hours later that night and the following morning when I really notice the benefits. I feel like I’ve had an almighty stretch, all lengthened and smoothed out. My joints – particularly through my spine – feel oiled, somehow. The spa tends to be pretty quiet in the mornings, because many guests head out after breakfast to make the most of the Alps, aka one of Mother Nature’s best playgrounds. During summer months, there’s hiking, mountain biking, cycling and wild swimming to enjoy. In winter, it’s all about embracing the snow. 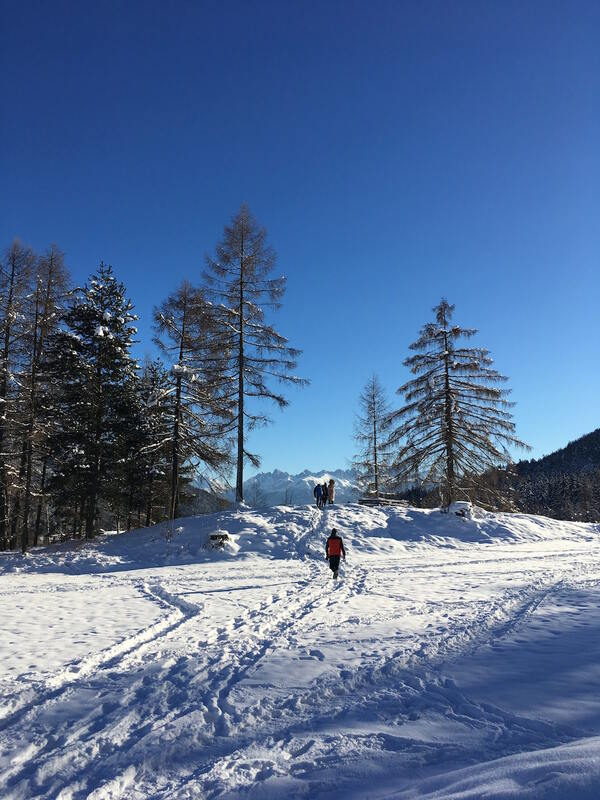 With limited time, I forgo the lifts and walk into Seefeld for a two-hour cross-country ski lesson. You can book this yourself separately, or Astoria can help with arranging kit hire or an active package deal – prices vary depending on the length, number of people and time of year. 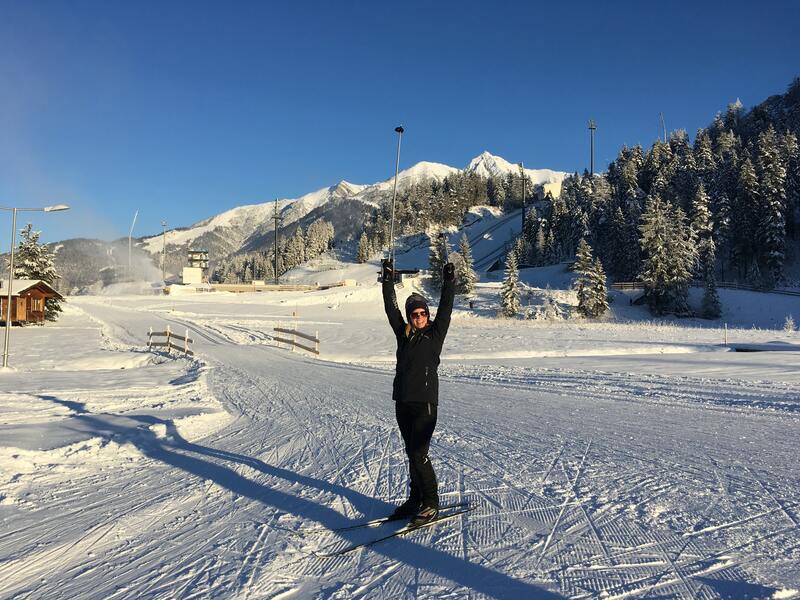 This is certainly the place to do cross-country, boasting 279km of trails to explore (Seefeld will also be hosting the 2019 Nordic World Ski Championships from February 19-March 3 and has previously hosted numerous Winter Olympic Games). There’s a hire shop, Norz (sport-norz.at), right next to the start point, where I meet the private instructor I’ve booked via Cross Country Academy (€120/£108 for two hours; xc-academy.com) and get kitted out. Never tried cross-country ski? It’s very physical and a totally different technique to downhill skiing (all about balance and gliding), but with gravity and the faff of ski lifts out of the picture, you can make pretty good progress and have a jolly good time, even if you only have a few hours to spare. Afterwards, I traipse into Seefeld and warm up with some steaming glühwein. Small enough to explore in an afternoon, there’s a few streets of shops, a casino (the nightlife highlight), a handful of bars and a pretty market square (just head towards the tall church spire and you’ll find it). The best bit, though, requires a 10-minute hike up the country lane tucked just to the left of the church. 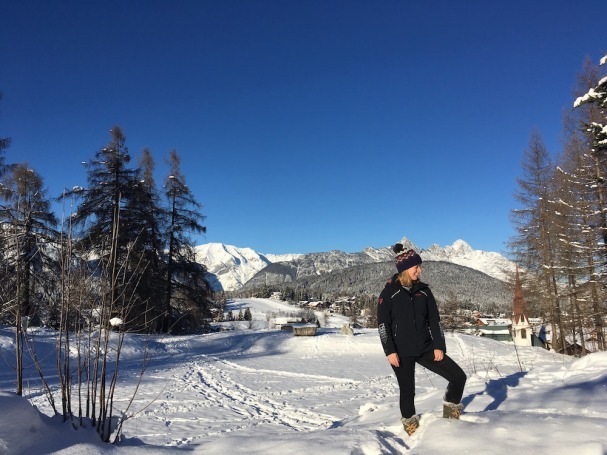 Leading onto an open meadow, a smattering of fir trees scattering shadows and sun-rays across the snow, this is where I find Seefeld’s most beautiful views. But drinking in those Tyrolean peaks from a bubbling Jacuzzi back at Astoria – knowing there’s a big glass of wine waiting to be enjoyed later, curled up by that fire – is pretty hard to beat. Doubles at Astoria Resort Seefeld (astoria-seefeld.com/en) cost from €175 (approx £157/AED 737) per person, per night (two sharing) on a full-board basis. Includes use of spa facilities, but treatments need to be booked separately.